Lapidary literary craftsman, expatriate, traveller, wanderer, quiet adventurer, bohemian, and half of one of the world’s most curious and beguiling marriages, Paul Bowles was one of the Twentieth Century’s finest writers, and in my estimation among America’s most superb ever. Most famous for his early novel The Sheltering Sky, a tale of willful alienation, exotic escape, indifferent journeying and languorous self-jeopardy, very little else of his work has been appreciated by a broader audience. Yet, his other three full novels, Up Above The World, Let It Come Down, and Spider’s House offer the same compelling combination of existential drift, exotic peril, personal tumult and stimulation of the various senses. Spider’s House would have an extra resonance for contemporary readers, engaged as it is with Arab ways, and an Arab world in transition from indifferent colonialism to something else, the looming menace of the fundamentalism to come already evident to the present and observant, which Bowles impeccably was. 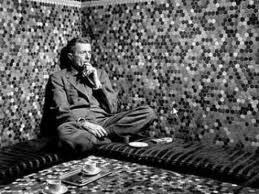 Paul Bowles lived the better part of his life an expatriate writing in Tangiers, though his writing career followed his earlier one as a successful composer of minimalist classical music and theatrical scores. Barely twenty, he had absconded from the University of Virginia to hang out in Gertrude Stein’s famous Paris salon, and soon after to study and travel with celebrated American composer Aaron Copland. Bowles has said that while living abroad with his wife Jane, he switched from composing music to writing, the principal pursuit of his wife Jane, ambient noise ever present in their various living quarters interfering with his compositional process to the point he finally gave it up. 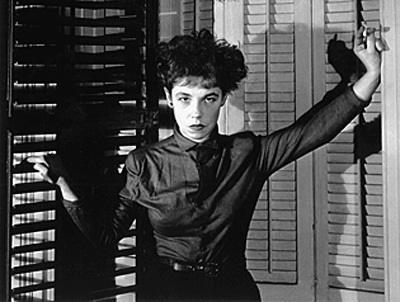 Jane Bowles, a writer of repute herself, whose novel Two Serious Ladies is an idiosyncratic and mesmerizingly peculiar gem in its own right, was his partner in art and travel. Each of them existed somewhere on the sexual spectrum between asexual and bi-sexual, and romantically operated independently and as a unit, often traveling together, often traveling apart, both writing with the immediate support and assistance of the other. Endearing to bohemians everywhere was the proliferation in Bowles’ novels and stories of the indigenous North African version of Chronic, called kif, smoked often and everywhere, and eaten in a fig or date pastry/brownie concoction known as majoun. Excellent with mint tea. Celebrated in some circles more for the icy craftsmanship, sublimity, elegance and rapidly unexpected appearance of casual brutality in his prolific short stories, most of Bowles’ writing depended in varying degrees on the cultural misapprehension of Westerners in distant lands, the pleasures and perils of remoteness, physical and otherwise. Bowles’ stories are the proverbial page-turners, and one usually departs them with a distinct sense that well-meaningness is of little use in the wrong place, that one confuses the ostensibly simple with the benign at great peril, that strange excitements and pleasures of exoticism are exceedingly tantalizing until they are not. Perhaps the most enticing groupings of stories, aside from the comprehensive Collected Stories, are the volumes entitled The Delicate Prey and A Distant Episode. Bowles documented much of his multitude of travels in straightforward autobiographical writing and memoirs, books such as Without Stopping, and Their Heads Are Green And Their Hands Are Blue. Throughout his life, Bowles also recorded a considerable amount of indigenous Moroccan music, as well as writing down and subsequently translating intoxicating tales rendered by several outstanding Moroccan storytellers, in particular the marvel Mohammed Mrbat. These yarns share with Bowles’ writing a surprising kind of magic wrought with mystifyingly evocative, spellbinding leanness.